Lately there has been talk going around of American Express releasing a new and possibly increased sign-up bonus on the Starwood Preferred Guest credit cards. It looks like the new sign-up bonus offers are live! You can check them out and apply for them here. The new limited time offers are slated to last until October 19th, 2016. After that it’s predictable, but uncertain that the offer will revert back to the 25,000 point sign-up bonus. The bad news is that the new sign-up offers are for two free nights at any SPG category 1-5 property.This makes the sign-up bonus worth 24,000 to 32,000 points. In my opinion this is much less exciting than last years all-time high 35,000 point sign-up bonus that the cards offered. Plus, with the new bonus offer structure you lose the ability to transfer SPG points to airline programs. The personal version of the card has a new offer for two free nights at SPG category 1-5 hotels & resorts worldwide after spending $3,000 in purchases within the first 3 months. Link: Learn more about the offer here. The new offer appears to only be live through American Expresses mobile site and the previously existing 25,000 point offer is still available. This means you can choose between applying for the two free nights or 25,000 point offer and it will ultimately depend on how you plan to use your SPG points. The business SPG Amex is offering two free nights at SPG category 1-5 hotels & resorts worldwide after spending $5,000 in purchases within the first 3 months. What is the 2 Free Night Sign-up Bonus Worth? Considering you can redeem the two free nights at any category 1-5 SPG hotel you’re going to get the most value redeeming at a expensive category 5 property. You can find a full list of SPG category 5 properties here. 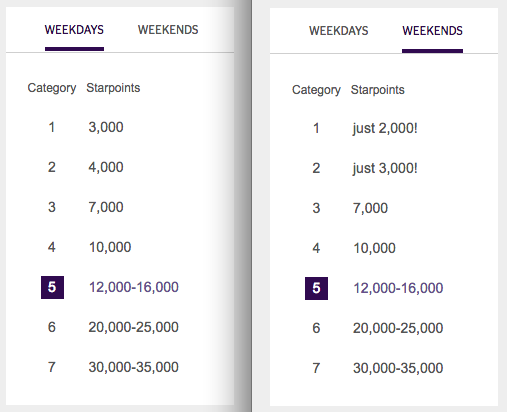 For reference, here is Starwood’s award chart for both redemptions on weekdays and weekends. When you redeem the two free nights at a category 5 hotel you’ll get stay worth anywhere from 24,000 to 32,000 points. More expensive SPG category 5 hotels run around $250 to $300 per night, which puts ths sign-up bonus at a rough value of $500 to $600. The fact that the Marriott and Starwood merger is moving forward means that these card offers from Amex will only be around for a limited period. That means it’s likely a wise idea to earn the sign-up bonus before it’s too late. In the future Starwood credit cards will be issued by Chase and there are rumors speculating that a new card will be out in February, but time will tell until we hear or see anything official! The new sign-up bonus offer of two free nights at any category 1-5 hotel is worth up to 32,000 points when redeemed at a more expensive category 5 hotel. The major drawback of this offer in my opinion is that due to that the bonus is awarded as free night certificates you lose the ability to transfer points to airline miles, which is one of the main aspects that make SPG points so valuable. Obviously this is not as valuable as the straight 35,000 point offer that was available last summer, but it looks like this time around that offer won’t be coming out.